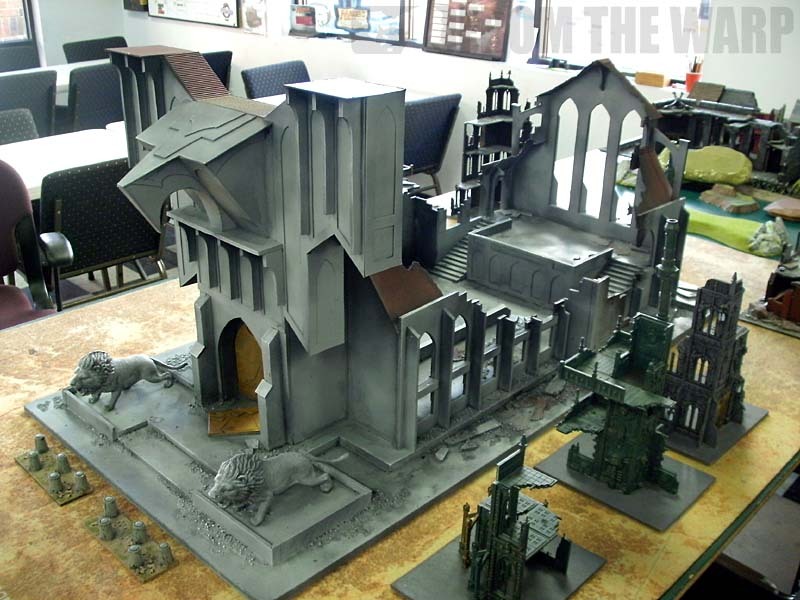 There are a number of things to keep in mind when making terrain whether it be for your gaming table at home or your local club. I think the single most important thing is usability. Looks are a very close second, but if it can't be used in a game and add to the quality of the game overall, what's the point? The cathedral above was a piece I did a while ago. It's the biggest piece I've ever made coming in at two feet wide by four feet long. That leaves one foot of space all around it if you place it in the middle of a regular sized board. Most importantly, it's usable. This particular piece is not without its flaws though. Because of it's size, it can be a bit unwieldy to use and work around with other terrain pieces. It can monopolize a table quickly. It could use a few more details as well to bring it to life. But... those are secondary things. How do you make terrain usable then? It's easy to explain, but hard to do when it comes to construction. You need to be able to place models in and around your piece. You want models to be able to interact with the terrain during the game. You want key areas to be wide enough to accommodate certain size models. You want there to be places to hide behind and get partial or even full cover from the enemy. You don't want to have to worry about models always falling over or getting damaged during a game. Putting that into reality can be a different story. The biggest thing I do when building any kind of terrain is to have my army handy. Test out your terrain as you build it. Will a model be able to stand on the steps leading up to the second floor without falling over? Can you actually hide your dreadnought behind that wall? Can a tank fit through that particular opening in a wall? Set your models on there and see. Test it out as you build your piece. You may have to make some minor adjustments here and there to accommodate what you want, but it's well worth it in the end. 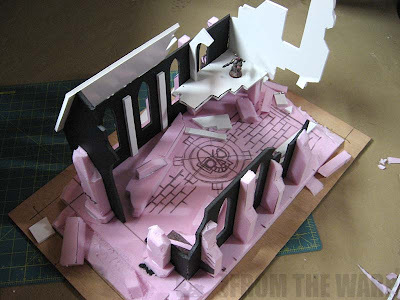 Does making a terrain piece usable have the potential to create some odd looking shapes here and there because you had to elongate or widen a particular feature... possibly. But the enjoyment you'll get when you can actually run your dreadnought up the wide staircase to the top of that altar of doom is well worth it. Start with usability in mind in the beginning and work towards that as you actually construct your terrain piece and you'll come out much better in the end. Don't just build something and set the final piece on the table only to see if it works then. Set yourself up for success from the start. You'll find yourself using terrain more and having it add to your games instead of being a constant source of frustration. Is defined area terrain a must have game mechanic? Another thing that always seems like a complete no-brainer, but many people forget: Always keep a standard infantry model on hand while building terrain in order to check if the scale works out! Wolfen: You're right, I've seen some gorgeous stuff out there that creates more problems than it's worth and you opt out of using it because you don't want the headache. KrautScientist: There's nothing wrong with the one you built. Your building suffers from the same thing mine does... lack of smaller details. I bet if you added a good bit of rubble and debris piles to yours, it would come right to life. It's a visual thing. The building is partially destroyed, but we see no debris anywhere and it clicks in our brain that something's not right with the building overall. I have some rubble on mine, but not enough really for the damage that has been done to the building. Adding those larger piles of rubble can be time consuming and lots of work. Not to mention you need to make sue that models can move over it and be positioned on it as well! Funny you write this today as I have just started my realm of battle board. Infact yesterday,I changed the layout a few times to optimize how the men sit on it. What I am trying to pull off is magnetizing the main building walls so I can store the buildings easier. This is a great post. I think we all know from experience that it is too easy to make some terrain that looks pretty awesome but can't actually function on the table. If the piece has no functionality or usability, it becomes a dust collector. No one will want to use it. I am in the middle of making an Imperial Cathedral. It is a slow moving project that work on when I have nothing else in the hobby queue. Ron, this is a great post. Something I'd like to add is to make sure that there are enough holes and such in walls so that your models can fire out if you want to. 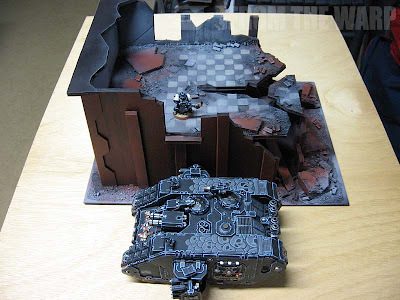 At my FLGS, they have dozens of ruins that were built using the Cities of Death kits, but back then you just assumed there were holes for models to shoot through and be shot at. With TLoS, many of these ruins have whole floors without any visability. Lastly, I'd like to add that you should never be afraid to modify your terrain if it proves unwieldy of lacking when in actual use. Your article is a good reminder, I always try to keep the rules for the game in mind when building terrain - for example, in Mordheim, minatures can run over barricades that are less than an inch high. Making them a fraction too tall makes a significant difference to their effect on a game. As funny as it sounds you really really need to check out some of Martha Stewarts Paint. Huge line and possibly better coverage than GW. Will: I never thought about magnetizing terrain to make it easier to transport. Once i make something, I just leave it at my FLGS for everyone to use. It would get no use sitting at my house. As far as paints, I use the cheapest stuff I can find since it can take so much to paint things this big. I tend to spraypaint the basecoat, use a few washes for shading and then a quick drybrush for highlights. Not much more. Feldmarshal Goehring: Looks good. Having a big project like this you can work on and switch gears can make for a nice change when you're feeling burned out with models. Montyhaul: Very true. Mordheim is a great example of that. Things like moving up a level and the height a jump pack equipped troop are important. is there an online resource of plans for building terrain? im thinking plans for different buildings etc. Seems to me there may be a need for one if it not already done. Ph0n1k: That's a good question, I do not know of one. I have some basic building templates that you can download and use. I have them on my Downloads page here. Right under the sixth edition updates in the right hand column. They are the old GW templates, but are great for getting started. @Ron/Ph0n1k: Here are a couple places I've found... but the one that takes the cake is Bugbait and his epic Warseer terrain thread. Timothy Hamel: Thanks for the links! It was $1.52 for 2 fl oz just a quarter cheaper than Folk Art but way thicker with more pigment. I must admit the cathedral is impressive. I have also built a gothic temple some time ago (not as big as yours, but close in scope) out of cardboard and some templates I designed. But I found out it was not as usable as I had hoped, mostly because the structural reticle is a bit too small for the hand to reach comfortably. I learned a lot from that experience. In addition, the building itself lacked detail, and I knew I could do much better if I switched to another medium. Therefore, I decided to tackle the problem from its roots, and develop a modular terrain system from scratch, with heavily detailed wall sections casted in resin, then build a cathedral out of these pieces (which would end being way bigger than the previous one, probably filling the whole gaming board). My main concern is usability. I designed and built several different walls. Those who totally block line of sight, those who have windows for infantry to take cover and shoot from, and some sections that block line of sight for infantry but allow vehicles to fire turret mounted weapons and highly placed sponsons, in addition to gate sections. I have also designed removable rooftops, and intend for buildings to be able to be partially disassembled during gameplay with high floors easily stacked over lower ones. Each storey can be 3 inches tall, or use a two-storey wall to have a ceiling height of 6 inches, making sure infantry can climb properly. All the buildings would fit in a 5 inch wide grid of walls and pillars. As I cast more pieces, I intend to move past a bastion like structure into a wide array of buildings. After looking at your concerns and wise words of advice, I wonder: ¿Do you have any tips regarding building shapes and table composition? I have designed a sample board with roads and buildings in a modular fashion, allowing for a huge amount of combinations, but I am not totally sure about building configurations. I would like buildings to be expressive, to have a shape which made sense in context, while still be part of a cohesive board. So, what would you consider a good building configuration? Which requirements do buildings need to fulfill to play a great role in a board? Should buildings be focused in one single direction, having full sides of the buildings with no windows at all? Is there a true limit regarding how high should buildings be, since units would require an unreasonable amount of turns to reach their top floors? Should all buildings have a similar size, or would it be better to create certain bigger buildings to focus the board on them? Wouldn’t that lower the different feel of the several board configurations you could build using a modular board with fixed buildings? Unknown: What a great set of questions. I like your cathedral and can see where you might have issues getting your hands in there to move models around. The cast stuff you have looks incredible with all of it's detail. To answer your questions though... a modular table or terrain pieces you can use to make up a modular gaming area starts with their bases. Coming up with a grid system you can use and have things be interchangeable. I found the actual shape of the buildings doesn't matter as much as the footprints of all the pieces you are combining does. For example, making everything off of a 6 inch grid. Pieces would need to be 6 inches, 1 foot, 18 inches, 2 feet... of some measurement that fits onto the six inch grid. They key is making it so that things can be put together in any combination. If you have a road that is 6 inches wide and it's next to a building that is on a base that is 18 inches wide, you have a two foot section. The actual shape of the building on the 18 inch base doesn't matter as it's base fits into the rest of the bases on the grid. As far as height and moving actual models around on the board, you can alter the rules as you see fit to make the game flow better. For example, we used to get rid of all difficult terrain and just had models move normally through stuff. That way we had the cool looking table and still had a game that did more than get bogged down in terrain checks every turn.